Taking advantage of one of these offers, my parents and I headed to Foxwoods Casino for an afternoon. Since none of us were interested in gambling at the tables, we traded off our vouchers (i.e. sold them to the guys waiting at the bus drop-off for people like us) and headed for Festival Buffet to eat lunch instead. 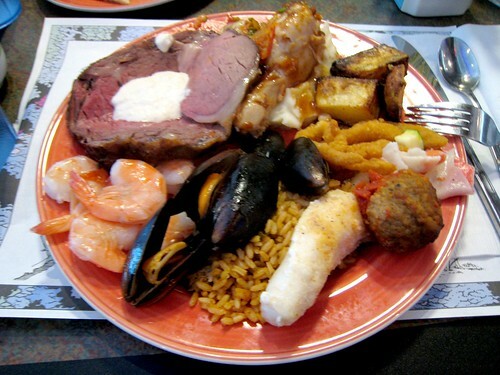 The food is just as you might expect for a buffet in a casino—some items were good (the surprisingly tender slice of London broil, the shrimp cocktail, all things battered and fried) but most of them were mediocre (all of the food at the Chinese and Mexican stations, any attempt at seafood). Still, while sheer quantity doesn't usually make up for quality, in this case some combination of both factors made the meal decent enough. Thus fortified, we spent the next few hours at the penny and nickel slot machines. Once we blew about twenty bucks we took the bus back and called it a day. What can I say? My parents and I may love a bargain, but gamblers we are not. Now that I no longer work in NYC or have my own place in Astoria, when I'm back visiting it's a rare occasion that I arrive to Manhattan early enough to have breakfast on my own. My parents' house is deep enough in Queens so that by the time I wake up, shower, pack my bag, and make my way downtown the clock is usually ticking toward noon; plus, there's so much food in the house there's no reason to wait until I reach the city to eat. But one day last week I had stayed with TL, and woken up when he left for work. With nothing else to do in his apartment, I decided to head in to Think Coffee for the afternoon. I could have gotten off at a closer subway station, but I arrived to Union Square around 9:45am, fully intending to eat a fun breakfast first. 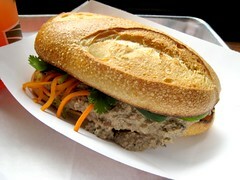 I hadn't decided where until I passed the sandwich shop Num Pang, which I'd been wanting to try for a while. The girl at the window informed me that they wouldn't be open until 10. And I'll say this—while she wasn't unfriendly, she certainly wasn't friendly, either. Maybe I've grown soft from hanging out in Colorado, where strangers smile and say hello even when you are simply passing them in the aisle of a grocery store, but to me her vibe seemed unnecessarily aloof, given that for a while I was the only person standing on the sidewalk outside of the shop that morning. Whatever. I decided to wait anyway. At 10:01am, she took my order. Having had ample time to consider what I felt like having, I asked for the blood orange lemonade and one of their daily specials, a lemongrass chicken liver pate sandwich. I was order #0001 on the receipt. And then I settled myself upstairs, in front of a window facing out onto the sidewalks. 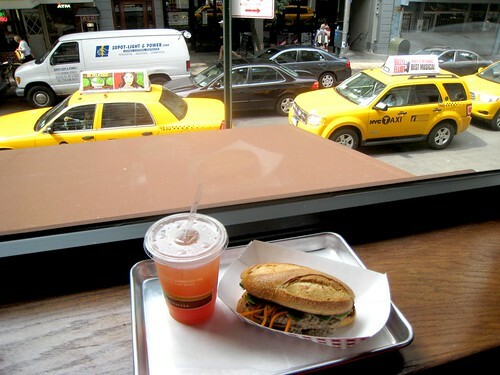 I must admit I felt quite luxurious, leisurely sitting down for breakfast while cab after cab clogged the street below, ferrying people to work. 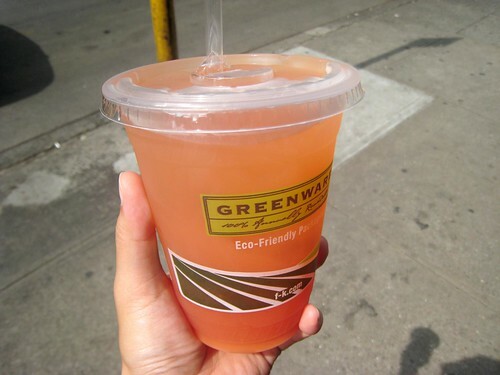 I was glad to be waking up my sleepy tastebuds with cold, sweet blood orange lemonade instead of rushing to an office. As for the sandwich, it was good. I'm not sure how much I would sing its praises beyond that. At $7.25 for a relatively small sandwich, it wasn't cheap. The chewy toasted roll was delicious, but too stiff to properly hold its contents without squirting them out the sides and bottom—I ended up splitting my sandwich into two open-faced halves, not wanting to deal with a landslide of pate each time I took a bite. 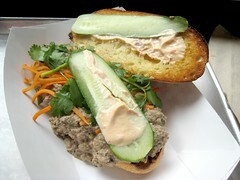 The pate itself was studded with coarsely ground peppercorns and had a loose, chalky, vaguely gloppy texture; the advertised grilled pickled red scallions made no impression; the garnishes of cucumber, mayo, cilantro, and pickled carrots were fine. All the elements seemed of decent quality, but there was just something about the sandwich that felt like it had been executed with a lack of soul. Or perhaps I was just responding to that girl at the counter. Sometimes you just want a little friendliness in the morning, you know? For better or worse, the new beer garden Studio Square has grown immensely in popularity, drawing patrons from all corners of the city to its location in Long Island City/Astoria, Queens. On any given night the place is packed with a surprisingly diverse crowd, and maybe the menu is a reflection of its clientele—you can get a bratwurst with sauerkraut, a pulled pork sandwich, a portobello mushroom "burger," or skewers of chicken souvlaki, among others; you can also order sashimi or maki from the sushi menu. At the condiment bar, giant barrels of spicy brown mustard, sweet-hot mustard, and honey mustard sit alongside packets of soy sauce and wasabi. 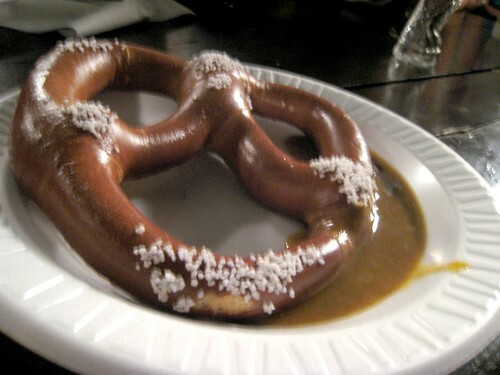 When there with MH a week or so ago the idea of chowing down on a spicy tuna roll while swilling Hoffbrau Dunkel didn't sit quite right with me, but eating chicken tenders, fries, and a giant soft pretzel did. The chicken tenders tasted like giant McNuggets, but the fries were perfectly adequate, as was the hot, fresh pretzel, which was delicious at least until it cooled down. Best to consume those quickly. TL and I, in search of late-night eats after catching a showing of (500) Days of Summer (a good flick, unless its story happens to mirror your own, in which case the movie is torturous) wound up at Seoul Garden, which was still hopping at 11pm. The night was hot and muggy and I had naengmyeon on the brain. I barely even touched the panchan when it came out—all I wanted was something cold. 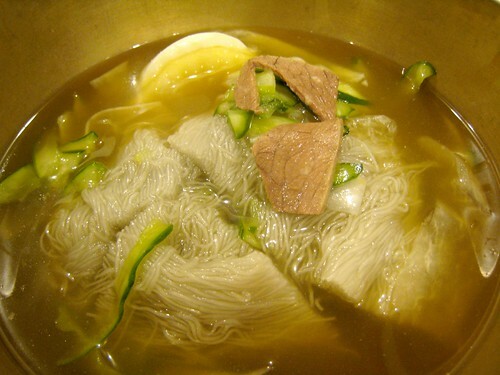 I hadn't had naengmyeon in ages, but I fondly remembered the thin, intensely chewy buckwheat noodles; the icy beef broth shot through with hot mustard and citrus; and the garnishes of sliced pear, hard-boiled egg, beef, and ribbons of pickled daikon and cucumbers. The best versions I'd tried had included a handful of ice cubes or crushed ice in the broth, too. It's a strange dish, to be sure, but it's also one of the most refreshing variations of cold noodles I can think of, beating out both cold soba and hyashi chuka. 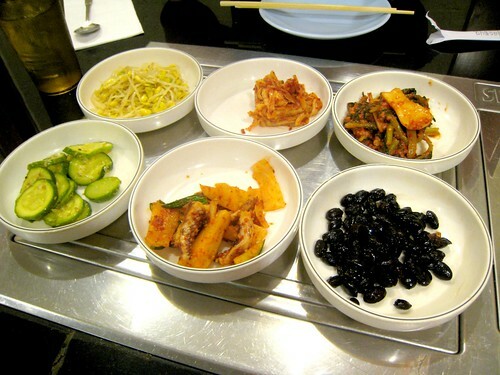 At Seoul Garden the clean-tasting beef broth was deliciously cold, tangy, and sweet, but I was surprised at how clumpy the noodles were—when the server snipped the mass of noodles in four with his scissors, they remained into four solid sections instead of collapsing out into the broth. After failing to loosen up the noodles with my chopsticks, I gave up and ate some of the clumps whole. Otherwise this version wasn't bad, and actually I kept thinking about getting my hands on another bowl for a whole week afterward. 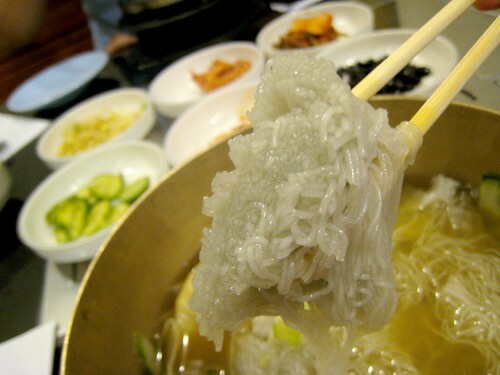 During the humid summer days of NYC, a meal of naengmyeon just can't be beat. Look closely. See that woman down by the orange traffic cone, climbing down into a manhole in the middle of the intersection? A few minutes later, I was doing the same thing. There's an explanation for why, but I'll get to that in a moment. First, there was beef cheung fun from a cart at Hester and Elizabeth, which TL and I had that morning for breakfast in Chinatown. The woman topped the steamed rice noodles with soy sauce, sesame seeds, and a thin peanut sauce, which added necessary flavor since the meat portion was decidedly skimpy. This version was a quarter cheaper and pretty good, but in the end I'd rather have the prepared-to-order cheung fun from Corner 28. 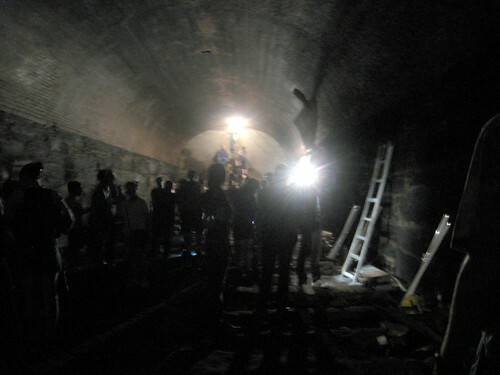 …and into a centuries-old abandoned tunnel running under the streets of Brooklyn. Built in 1844 and sealed less than a decade later, the whereabouts of the Atlantic Avenue tunnel remained a mystery until nineteen-year-old Bob Diamond finally located it in 1981 and worked to open it up again to visitors. Go here to reserve a spot on the tour and you can hear Diamond tell his tale yourself. 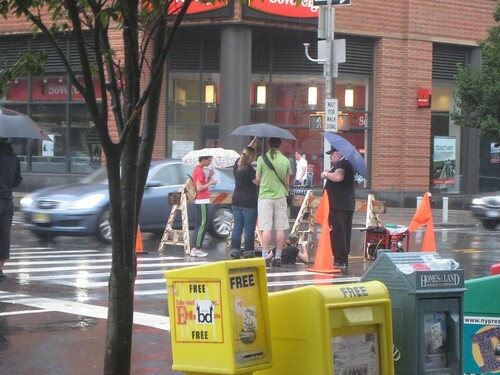 I was reluctant to leave the cool, dark tunnel for the humid sidewalks aboveground, but luckily by the time we finally surfaced, the rain had ended and the sun had come out. 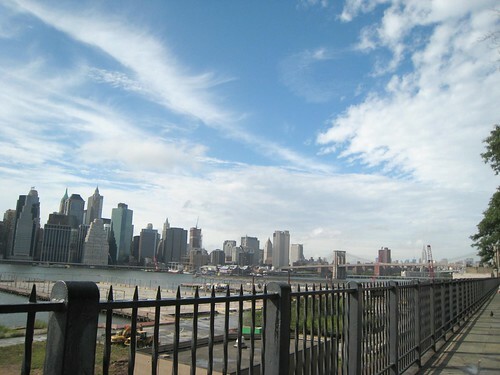 TL and I decided to walk along the promenade to catch the end of Brooklyn Flea. By the time we arrived, though, there were only a few vendors left in the market and only one was still selling any food. 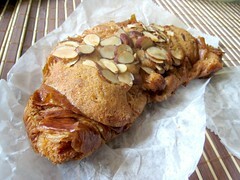 I picked up an almond croissant and a brioche to eat later. 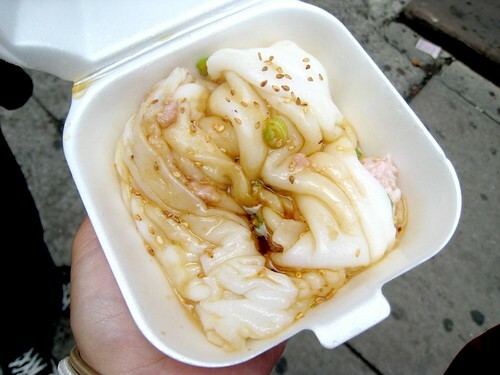 But there was still the matter of lunch—after having only eaten cheung fun seven hours earlier, TL and I were famished. What to do? 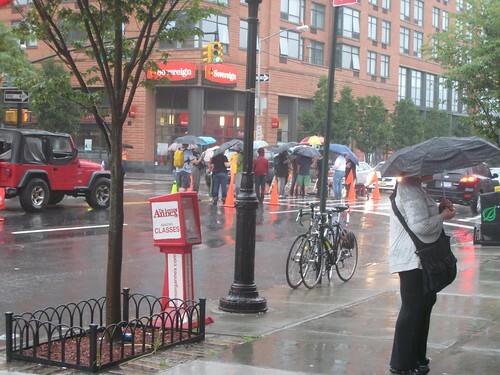 I was thrilled when I saw that there was no line outside of Grimaldi's. 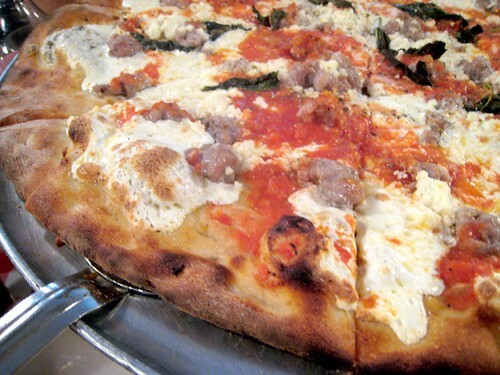 We sat down and quickly asked for a pizza topped with sausage, ricotta, and extra basil. Our hunger is my only explanation for what compelled us to order a large for the two of us instead of a small…both of us tried to finish the entire pie, but midway through our third slices we knew it'd be impossible to go on. It had been a long time since I'd last had really good pizza, and I dearly wanted to. I'm not sure how Grimaldi's compares to all the other coal/wood oven pizzas being served around town—I haven't tried enough of them to know—but whatever the case, I found this pie totally satisfying. Stuffed to the gills with pizza, TL and I headed back to Astoria. It wasn't until about 10pm that either of us felt hungry again. 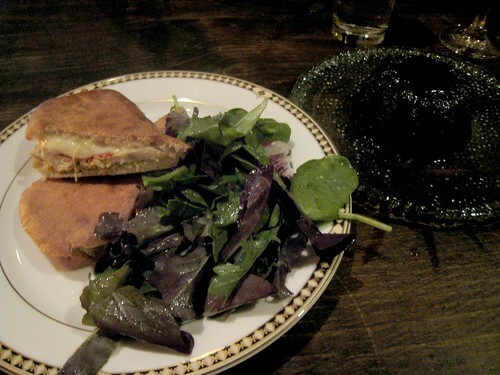 Luckily we had the leftover pizza and Brooklyn Flea pastries to sate our bellies. The croissant was quite good—just sweet enough, and the paste had a wonderful nutty flavor—but the brioche seemed a bit dry. 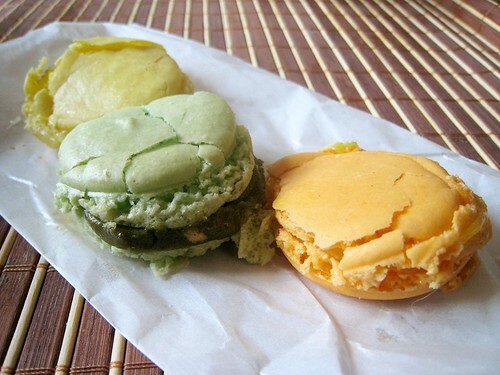 I had also picked up three macarons from Almondine, which had gotten a bit smashed on the journey home. At a dollar each, they were cheaper than most macarons but also quite a bit smaller. Happily, what they lacked in size was more than accounted for in flavor; both the lemon and passionfruit curds sandwiched between the almond paste cookies were bright and tart, tasting intensely of their respective fruit. The pistachio was less impressive but still tasty. 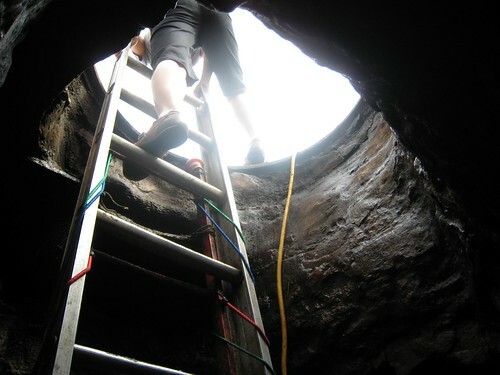 Between the pizza, the croissant, the brioche, the cheung fun, and the macarons, it was a totally satisfying eating day, but being able to go down a manhole into an abandoned tunnel was totally the icing on the cake. I should hang out like this more often. Back in NYC! The evening after I arrived, TL and I went to Winegasm, a sweet little wine bar in Astoria. He'd been there before and was a fan of its laid-back, mellow ambiance and welcoming vibe; I was happy to have a place to relax and chat. TL was hungry, so we ordered a panini and a dessert to share. 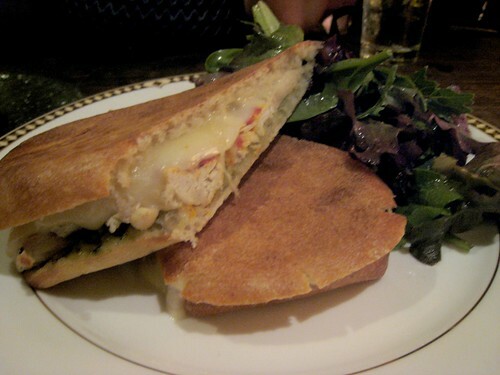 At eight bucks, the chicken version wasn't a bad deal: the hot, pressed sandwich was layered with chunks of chicken breast, a soft, gooey cheese (Swiss?) and paired with roasted red peppers, red onion, spinach, and a basil-laced mayonnaise. A perfectly dressed salad of tender mixed greens arrived on the side. The chocolate molten cake was good but typical; no complaints here except maybe about the price, which was only a dollar less than the panini. We showed up near closing time so didn't stay for too long, but I could see myself spending a much longer evening here, sipping on wine and grazing on some of their lighter fare. Winegasm might have a cheesy name, but it still seems like a good spot in the neighborhood. We've been getting herbs nearly every week in our CSA share, and even though I am splitting a single share with four other people, the big fresh bundles of dill, parsley, and cilantro were piling up in my refrigerator. I'd been storing them covered in a plastic bag with their cut stems submerged in a cup of water; while after a few weeks most had fared well, I was worried I wouldn't get around to using them before they rotted. 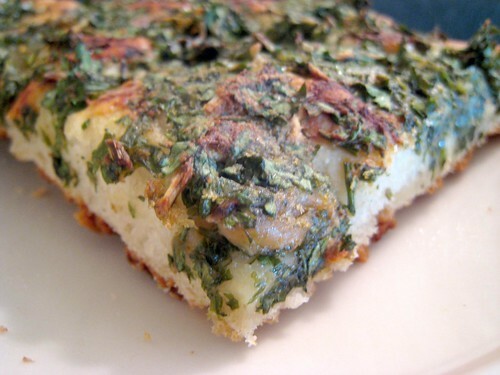 I knew that adding a sprinkle of chopped dill or cilantro to dishes here and there wouldn't cut it. 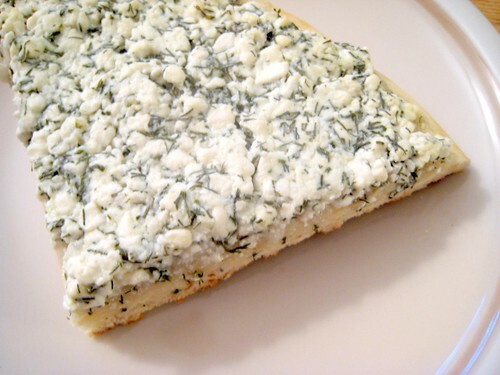 I started looking for recipes that would use up a lot at once, and that's where the idea of making herbed flatbreads came in. My first experiment was to attempt a replication of the roasted garlic and parsley flatbread JL had served for our sockeye salmon feast, but since she hadn't posted a recipe for it on FoodMayhem, I was left to figure one out on my own. Luckily, Colorado Review editor SG had recently given me a stack of old Cooking Light, Gourmet, and Bon Appetite magazines. While flipping through the August 2006 issue of Cooking Light I came upon a recipe for Bell Pepper Focaccia, and the base seemed good for what I was envisioning. 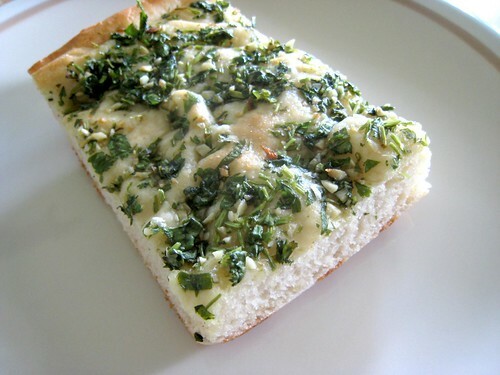 I swapped out the bell pepper topping for mashed roasted garlic and finely chopped curly parsley, which I mixed together with olive oil and salt to form a loose paste; then I spread this paste over the risen focaccia dough and put it in the oven to bake for 28 minutes, as the Cooking Light recipe directed. Unfortunately, 28 minutes was way too long. When I opened the oven door, I was dismayed to find dried-out herbs atop a tough, dark brown crust. 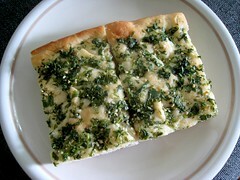 It was far from the focaccia of my dreams, though the flavor of the roasted garlic and parsley tasted spot-on. After that success I probably would have kept on going with focaccia, but then KS, who works at Cozzola's, bestowed upon me a large bag of leftover pizza dough. I wasn't sure how to work with the stuff so I just winged it: I rolled out the dough and topped it with layers of chopped up roasted cauliflower and broccoli (also from the CSA) and grated Monterey Jack cheese, then baked it in the oven at 400 degrees for about twenty minutes or half an hour. 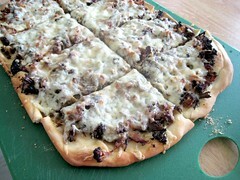 This combination proved delicious, but I should have let the dough rise for a bit before topping and baking—the crust was tough and almost cracker-like in the thinnest areas. I wasn't going to try making another bread at that point, especially because I was leaving for NYC in just a few days, but then I realized I had a nearly full container of cottage cheese in the fridge that I had mixed with lemon juice and chopped CSA dill. (I'd done this with whipped cottage cheese before and had been delighted with its dip-like properties, but done with small-curd cottage cheese, the dip seemed to lose its charm. So I'd ignored it for a while.) 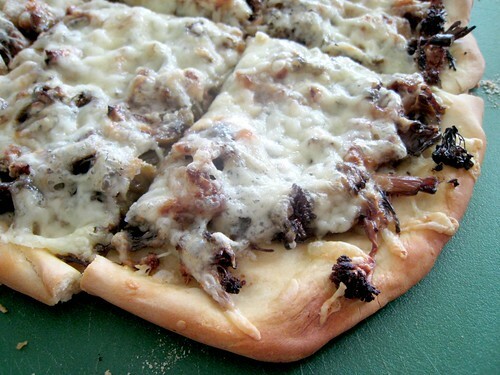 I figured if I spread the mixture on top of pizza dough and baked it, it would be another decent flatbread of sorts and I'd want to scarf it down. Unfortunately it didn't come out quite as I envisioned it, and the flavor was just okay. I ended up sticking most of it in the freezer, where it will probably languish some more. I'll have to work with this idea again. 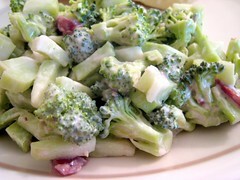 As for other CSA recipes, I only made a few new things: a salad combining chopped cherry tomatoes and CSA fresh raw peas with lime juice, olive oil, salt, and pepper; and a minimalist version of my "very merry broccoli salad," meaning chopped up broccoli, a dressing of half mayonnaise and half nonfat plain yogurt, and a few spoonfuls of cranberry chutney. Oh, and French breakfast radishes? I know it sounds weird, but they are delicious when eaten sliced up on top of pita chips (specifically the Stacy's brand, which I am addicted to). Something about the toasty, salty, hearty crunch of the pita chips paired with the spicy, fresh crispness of the radishes just really works for me. 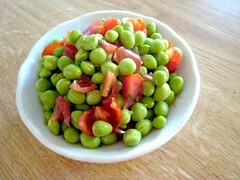 As always, if you have any suggestions for veggie preparations, I'd love to hear them. Hope everyone is doing well with their CSA bounty! To prepare dough, dissolve yeast in warm water in a large bowl, followed by honey and salt. Stir until well blended. Stir in 2 1/2 cups flour to form a dough and turn out onto a floured surface. Knead about 10 minutes, or until smooth and elastic; as you knead, add enough of remaining 1/4 cup flour, 1 tablespoon at a time, to prevent dough from sticking to hands. The dough will still be a bit sticky when it's ready. 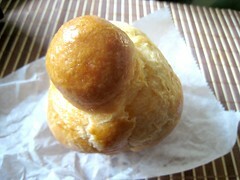 Place dough in a large bowl coated with oil, turning to coat top. Cover and let rise in a warm place free from drafts for about 45 minutes or until doubled in size. (It's done rising when an indentation remains in the dough after you've gently pressed a finger into it.) Punch dough down, and turn out onto an oiled jelly-roll pan or cookie sheet; press into an 10x8-inch rectangle. Cover and let rise 30 minutes or until doubled in size. In the meanwhile, preheat oven to 400 degrees. 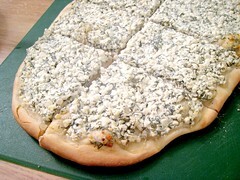 Make the topping: mix the cilantro, garlic, olive oil, and salt together and let sit until dough is ready. Uncover dough and make indentations in top of dough using your fingertips. 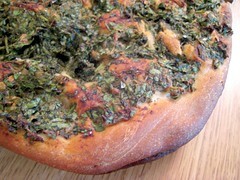 Using a spoon or your fingers, evenly spread the cilantro topping over the dough. Bake at 400 degrees for 15 minutes or until loaf is golden brown around edges and sounds hollow when tapped.